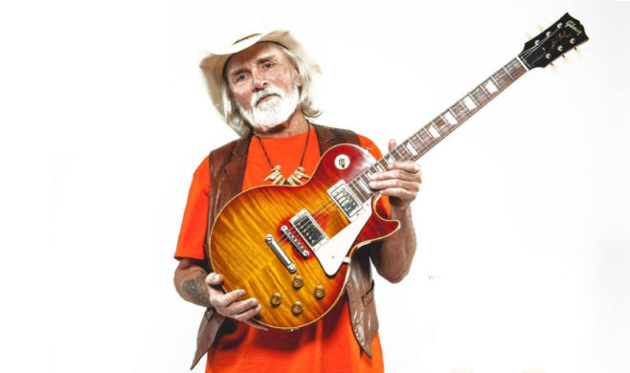 Southern rock legend and founding member of The Allman Brother Band Dickey Betts is currently in critical but stable condition in a Florida hospital after hitting his head, causing bleeding from his brain. Betts was in his backyard in Little Sarasota Bay, and slipped and cracked his head while playing with the family dog. The accident occurred on Monday (9-17), and Betts is expected to undergo surgery on Friday (9-21) to relieve swelling on his brain. In August, Dickey Betts suffered what was characterized as a mild stroke at his home in Sarasota, and had to cancel a slew of tour dates. However his manager David Spero said on September 14th that Dickey’s recovery was going better than expected, and he was already playing guitar, and looking to get back on the road soon. New dates were added to the calendar, but now those have been canceled as well. Though The Allman Brothers Band is officially retired, Dickey Betts has continued to tour and make appearances in his Dickey Betts Band and numerous other projects tied to the legendary Southern rock outfit. Really sorry to hear this. That guy is the best. Damn. Without a doubt, he was the guitarist that had the most influence on me as player. Such a monster player. The thing that I love about his playing is his sense of melody. His solos are gorgeous works of art to me. Take Ramblin Man, for example; he uses a country hexatonic scale that brings a certain prettiness to it. And don’t get me started on Blue Sky or Jessica, both masterpieces! I’m happy to have seen him live, and I hope he recovers so others can have the privilege of seeing the most legendary southern rock guitarist left on this planet. The solo in “Ramblin’ Man” is one of my all-time favorites. It has such an incredible “bounce” to it! He just had a stroke a month ago, too, right? poor dude. He never got the recognition that he deserved. He was indispensable to the classic Allman’s sound. Without him, the Allman Brothers would have just been another blues band. He added that country edge that created southern rock. Atlanta’s Burning Down is a great album. I hope for a quick recovery. I’m glad he is in stable condition. Sad news. He played on at least one Billy Joe Shaver record and I believe was a teacher to his son Eddy. You’re right , Dickey played on Billy Joe’s album ‘When I Get My Wings’ and throughout his career has recorded with everyone from Kitty Wells to Charlie Daniels,the Marshall Tucker Band,David Allan Coe,Hank Williams Jr. etc playing on literally hundreds of other albums including The Great Southern and Allman Brothers records,he’s an immense talented innovator and I wish him a safe and speedy recovery. Horrible news, hopefully the surgery goes well and he’s able to recover. Wow. Last week it was Alan Jackson’s son-in-law falling and hitting his head (and dying). I hope these don’t come in threes. I see today is when his surgery was scheduled, I hope everything went well. His name is so big in Southern Rock Music. Glad to hear he has been playing and touring still. I’m sure there were risks with this type of surgery. It’s good to hear it went so well, and that he has fans all over the world who were thinking of, and praying for him.